Joy Randel is a woman who has truly let her life go to the dogs … and she couldn’t be happier! After a decades-long career in the bustling Information Technology industry, Joy decided to combine her considerable technical expertise with her passion for animals and create the online boutique, DazzleDogDelight.com . Dazzle Dog Delight is designed to provide dedicated pet owners gifts and sundries for the “pet who has everything.” But far from being a nose-in-the-air enterprise for upper-crust pooches only, Joy’s primary mission for her company is helping fund organizations dedicated to the protection and nurturing of homeless animals. 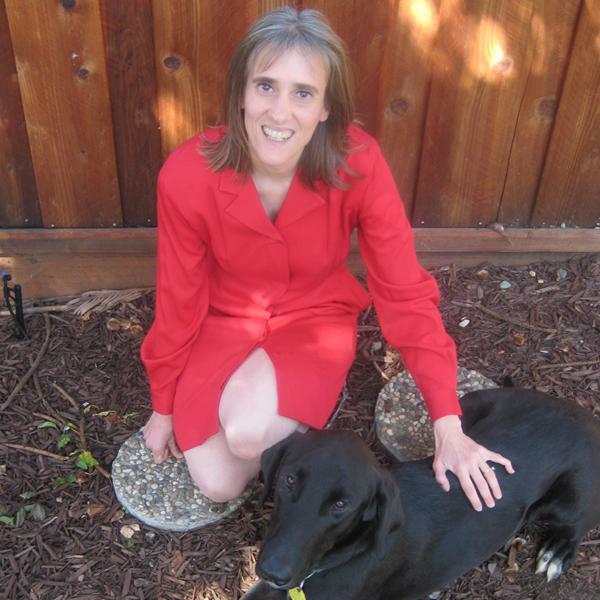 Joy works tirelessly with her local SPCA (East Bay, California) to promote awareness about shelter animals and animal adoption. 5% of all profits from Dazzle Dog Delight go directly to East Bay SPCA. Dazzle Dog Delight is a program that will focus on the myriad ways dogs contribute to the lives of women and children. In her six years as a Therapy Pet Volunteer in skilled nursing facilities, Joy saw first-hand how the presence of a dog can not only lift the suffering of a person in need, but often improve her health as well. Dogs often play a very special role in women’s lives when it comes to relationships – and Joy herself is no exception to this rule. When she was single and dating, Joy’s one deal-breaker was a gentleman not liking her dog, and vice versa. The man that would eventually become Joy’s husband (9 years and counting!) hit it off with her dog right away. Joy hopes to use Dazzle Dog Delight as a forum for discussing how we can utilize the sacred dog/human relationship to empower and enrich women. Dogs are special, complicated creatures with amazing instincts and awareness when it comes to assessing human beings, and this can be a powerful tool for their female masters. Of course, we will also enjoy light-hearted conversations about the way our pooch pals make us laugh and keep our lives buoyant.